Click here to visit the Vectrapet site and fill out the form. Then choose your location and finally you’ll be able to download and print a pdf good for a dose of Vectra for your pet. You can choose between Vectra 3D, Vectra Cat & Kitten, or Vectra® Dog & Puppy. 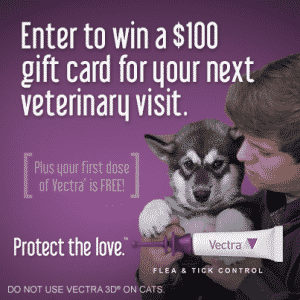 Just take the coupon to a participating Vectra Vet to redeem your complimentary dose.